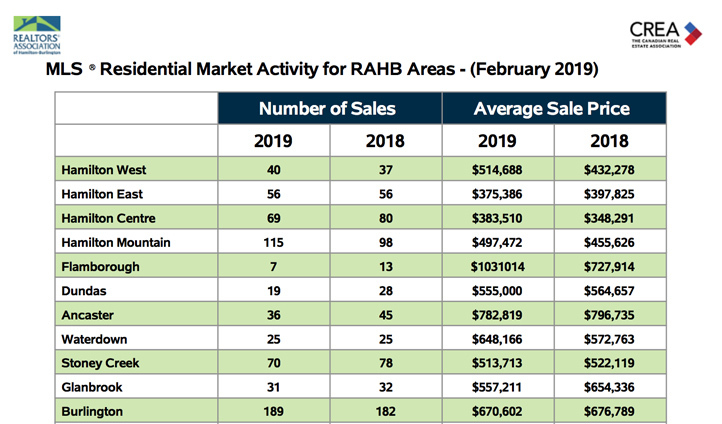 Let's take a look at the above chart, Residential Market Activity for RAHB Areas, and look at how Hamilton did during February 2019. Once again the Hamilton Mountain is the hottest area with a total of 115 sales, 17 more than February 2018. And Stoney Creek comes in at second place with a total of 70 sales for the month, another increase from the same time last year. When we look at the map, Average Residential Price by District, it becomes clear which areas had the highest number of sales. And we are able to see the average price in each area. 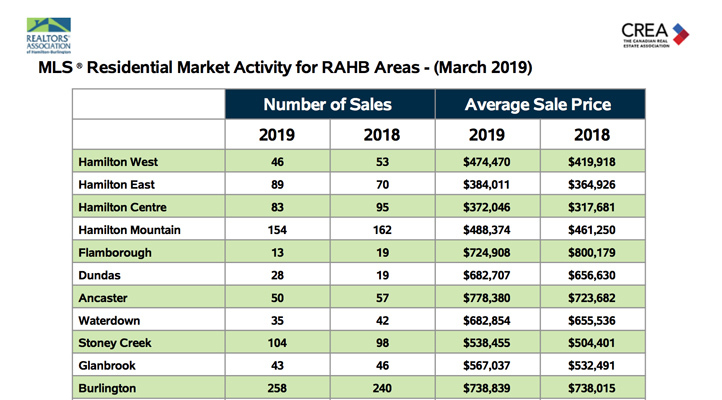 The area with the highest number of sales for February 2019 was from the Bay to the Escarpment (sub areas 16, 17, 18, 20). 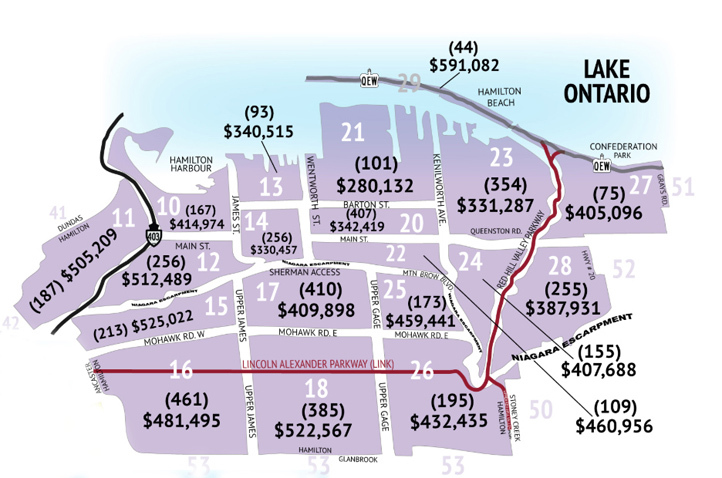 And the area with the most expensive homes were in Flamborough (sub areas 40, 43, 44, 45). And finally we can take a look at the final chart, Hamilton Residential Table. This chart indicates to us how Hamilton has done overall for the month of February. New listings saw an increase of 9% with 770 sale and the average days on the market saw a decrease by a full day. It's also important to note that the price of a home saw an increase of 3% and was $487,439. There was a reported 735 sales of residential properties located in the RAHB area with a 4% drop from the same time last year. And there was a 24% increase over January 2019 with the average price of a home from February 2018 by 1.9% to $557,135. "The trend for the past few months has been that more affordable properties and communities have been seeing gains, but this month the statistics vary regardless of the type of property and location. The numbers can change from one month to the next, and that's why it's best to work with a REALTOR® when buying or selling. They know their communities and have access to comprehensive data throughout the month." - RAHB CEO George O'Neil. Have you been been thinking of selling your home? You should get in touch with one of our sales representatives, they will be happy to go over the market stats with you and discuss possible next steps. And if you're wondering what your home is worth, you can try out will cost by using our what's my home worth calculator. 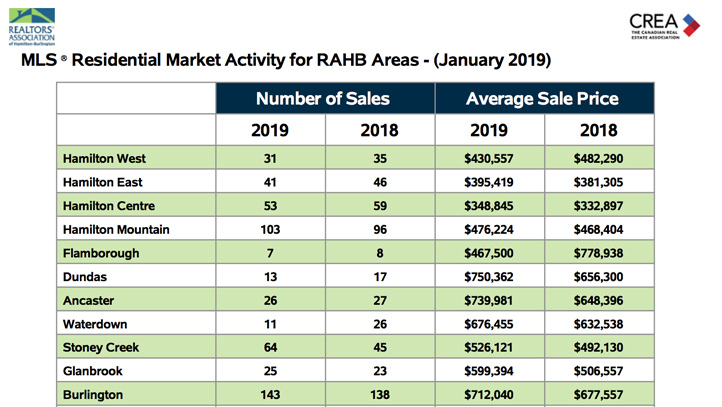 When we take a look at the above chart, Residential Market Activity for RAHB Areas, we can clearly see that the hottest area for Hamilton in January 2019 was the Hamilton Mountain with a total of 103 sales. Another area to note would be Hamilton Centre. This area saw a total of 53 sales for the month of January and compared to the same time last year, we can see a clearly see an increase. 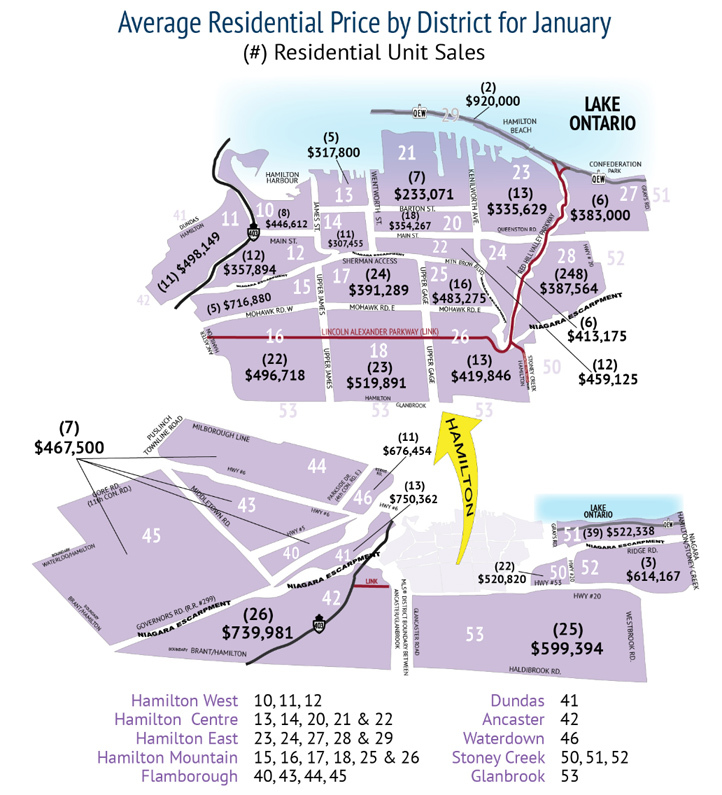 By looking at the above map, Average Residential Price by District, it's clear that the area with the highest costing homes was the Hamilton Beach (area 2). The average cost of a home in that area was $920,000. However we can also clearly see that the hot areas in Hamilton remain from the Bay to the Escarpment. The sub areas being, 20, 51, 42 and 53, all had the highest number of sales. And finally we come to the chart, Hamilton Residential Table. By looking at this chart we can compare January 2019 with the same month last year. 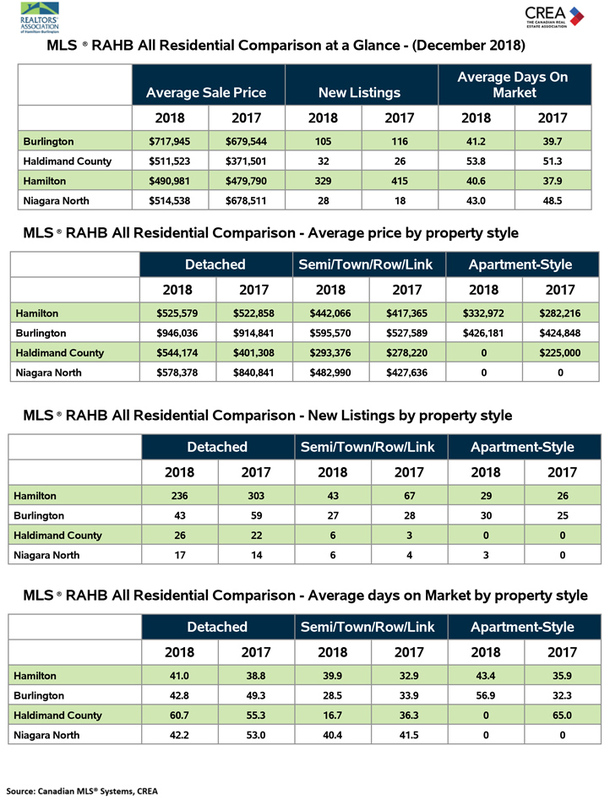 By comparing them we can see that the number of new listings has increased in January 2019. In that month we saw a total of 809 new listings compared to the same time last year it was 661. The chart also indicates that the average time a home is on the market for the month of January 2019 was 42.3 days. Which is very similar to the same time last year. It's also very clear that the average cost of a home has gone up by 6%. There was a reported 593 sales for the month of January located in the RAHB areas. There was also a 3.6% drop from the same time last year. And the average price of a home for the entire area was up by 4.7% to $550,058. "This is a promising start to 2019. For sellers, the average price of a home has increased over 100% since 2009. For buyers, sales activity has slowed, the number of new listings has increased, and we are sitting firm in a balanced market. The January numbers have picked up since the downturn we experienced in December." - RAHB CEO George O'Neil. If you've been thinking of selling your home, you can also get in contact with one of our agents , they will be happy to go over the market stats with you and discuss possible next steps. And if you're wondering what your home is worth, you can try out will cost by useing our "What's My Home Worth" calculator. In the above chart Residential Market Activity for RAHB Areas -2018 we can see that Hamilton Centre remains hot with a total number of sales of 1,047 for 2018. And we can see that Stoney Creek is also ranking near the top with total of 1,075 sales for 2018. 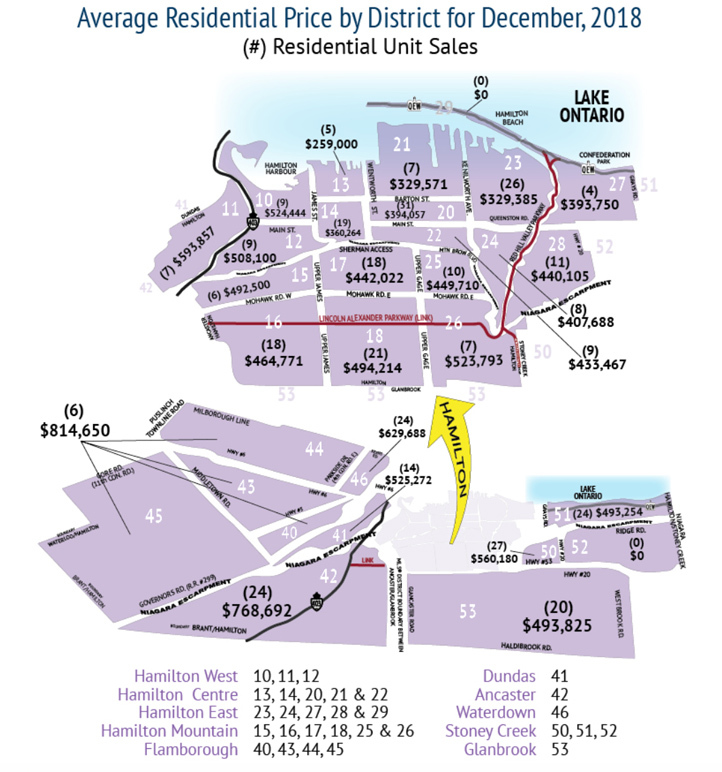 And finally, Hamilton Mountain had the highest number of sales with a total of 1,837 for all of 2018. You can also compare the average price of a home from 2017 to see how it has done in the same area in 2018. 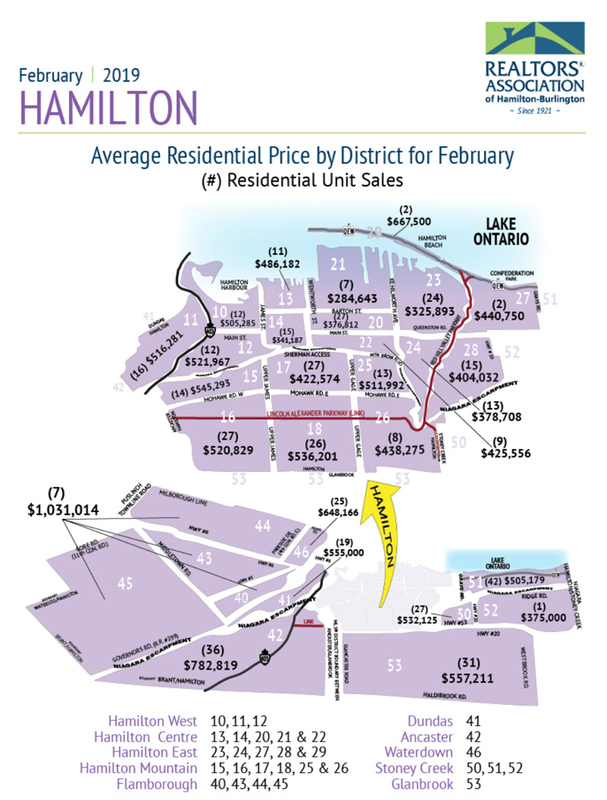 When we look at the map Average Residential Price by District - 2018 we can see that Hamilton overall has done very well. The areas to note are 16, 17, 18 and 23. They have had the most number of sales this year. And areas 11, 12, 15 and 18 had properties with the highest listing price. Hamilton has had a busy year from Barton st to the escarpment. The chart RAHB All Residential Comparison at a Glance - 2018, indicates to us that the isolated areas in the RAHB market remain Hamilton, Burlington and Haldimand County. Listings were down 9.2% compared to 2017 and sales were down 17.5% from last year. However, the overall average price of a home was only down 1.5% from the previous year. And over the past decade the average price of a residential home has actually gone up 100.5%. “The 2018 real estate market levelled out from the eventful years of 2016 and 2017. The market went from a strong, prolonged seller’s market to a balanced market where buyers had more time to view and compare properties before putting in an offer to purchase.” - RAHB CEO George O’Neill. If you think that it might be time to sell or you've been thinking of selling your home, you can get a better idea of what it will cost by useingour "What's My Home Worth" calculator. And if you would like to get in contact with one of our agents they will be happy to go over the annual market stats for 2018 with you. Take a look at the above chart, Residential Market Activity. We can see how much the average price of a home has changed in the same moth last year. And the hot areas for December are, Hamilton Centre, Hamilton Mountain and Stoney Creek. 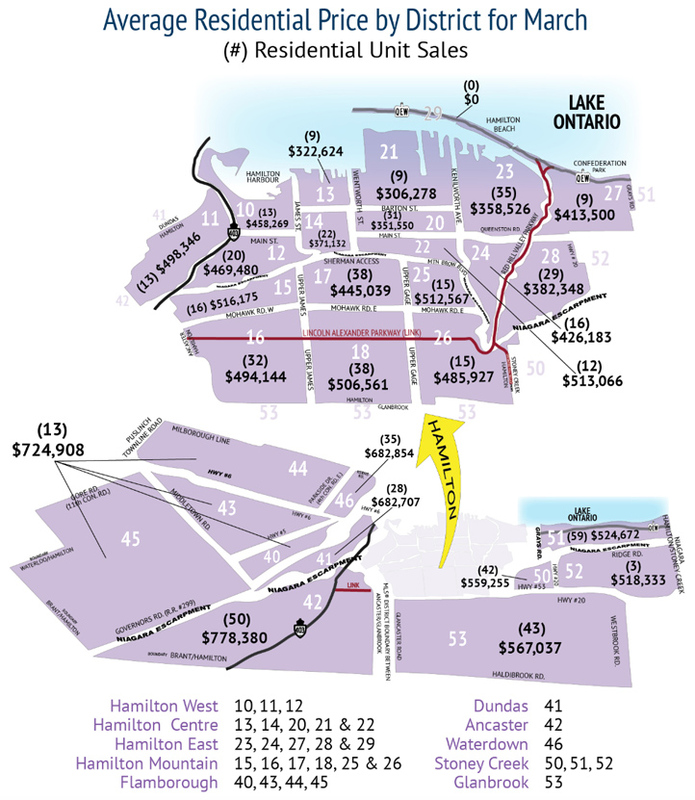 The above map The Average Residential Price by District, is clearly indicating the areas from the Hamilton Bay to the escarpment are continuing to do well (sub areas 20, 23, 42, 46 and 53). The map is also showing the average listing price of a home is in each area for December 2018. 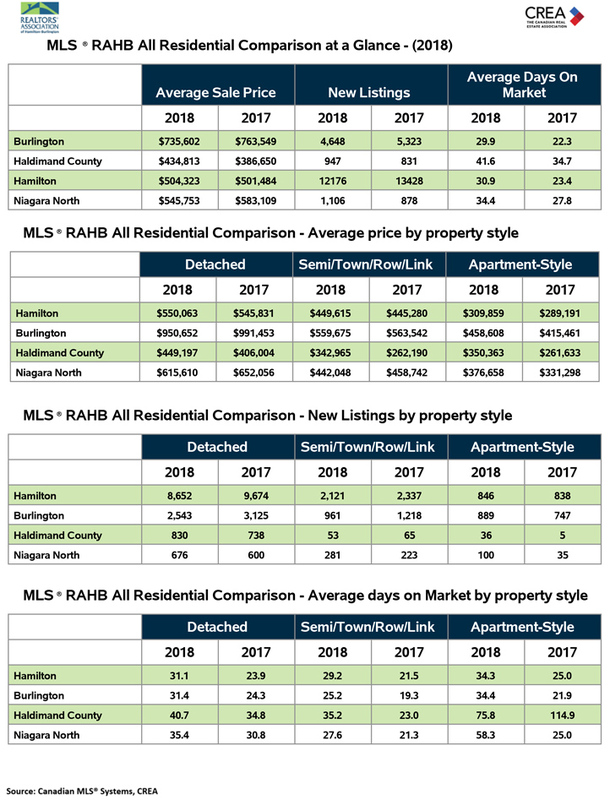 In the above graph All Residential Comparison at a Glance, it indicates to us that some of the major areas within the RAHB market remain isolated to the areas of, Hamilton, Burlington and Haldimand County. And it indicates that in the month of December there has been an increase in the average listing price of a home. The report shows a total of 534 sales of residential properties located within the RAHB market area. December 2018 had a 26% lower number of sales than the same month last year. However, the average cost of a home was up by 2.6% to $543, 210. And the year-to-date sales activity was down 17.6% from the same time last year and down 12.2% compared to a decade ago. Also compared to a decade ago, the price of a home is up 90%. And if you're thinking of selling your home and you want to get a better idea of what it will cost, use our "What's My Home Worth" calculator. You can also get in contact with one of our agents and they will be happy to go over the market stats with you and discuss possible next steps.